Modern CT scanners provide two dose parameters that both became available by the scanner manufacturers around 2001: the Volume CTDI (CTDIvol) measured in mGy, and the dose-length product (DLP) measured in mGy-cm. CTDIvol is a measure of the average dose within the scan volume to a standardized phantom. 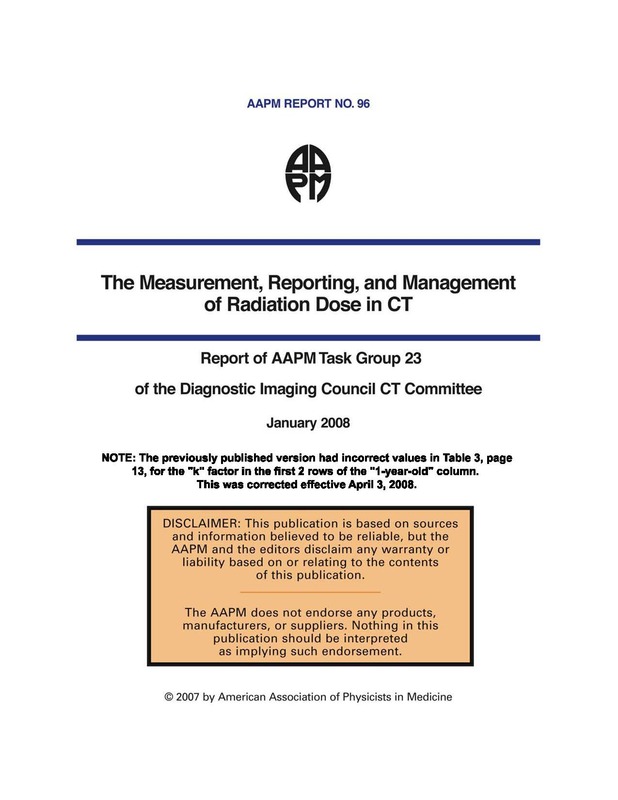 The total amount of radiation delivered to a standardized phantom is represented by the DLP, which is the product of CTDIvol and the scan length. Organ doses in CT are well below the threshold for the induction of deterministic effects (e.g., erythema, epilation). Patient radiation risks in CT are therefore those related to carcinogenesis. An estimate of effective dose (E), which is related to the carcinogenic risk, may be obtained by use of E/DLP conversion factors (Table 3). Effective doses from CT are much higher than effective doses in conventional radiography, but comparable to those associated with interventional fluoroscopic, diagnostic coronary catheterization, or nuclear medicine examinations. Although this risk from a CT examination is small, it is not zero. Hence, CT examinations should be performed only when a net patient benefit is anticipated. Further, the amount of radiation used should always be kept as low as reasonably achievable (ALARA).